We offer various forms of coaching including group coaching and one to one coaching. Whether you are a total beginner or experienced archer one to one coaching can be a great way to move forward. For the total beginner, we can deliver a dedicated lesson to teach you the basic understanding of archery. We will take you through the basics of archery and all the safety elements and add a few extra bits on the way. This is a very good session to lead onto the beginner’s course. For the experienced archer, we can look at your shooting technique and form. Give you advice and recommendations to improve your own shooting style. Help with the technical side of the shot with video analysis. We can also offer general advice on personal equipment. Help and advice with bow tuning including full bow setting up. Basic set up of bow. Bare Shaft or Walk Back Test. Adjust Weight to Archer’s preference. 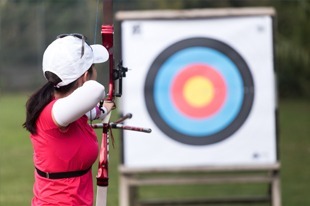 Our coaching sessions are held on our outdoor ranges. The cost of a full bow set up and 1 to 1 session is: £30.00 this includes 1 hours range time.